Simultaneously published at TeachGIS.org with thanks to Diana Sinton. I’m currently teaching two sections of the same introductory GIS course, one face-to-face (F2F), and one online. This morning I tried a little experiment – I taught my regular F2F class in a lecture hall as usual, but I had a live webinar version of it online at the same time. It went remarkably well, so I thought I would briefly explain what I did, why, and how. Students that did not attend the live lecture (in either section of the course) could see whatever I showed using the projector in class, which included PowerPoint slides, web pages, and a live demo of ArcGIS ModelBuilder. They could hear me talking, but could not see me (no separate video feed of the instructor). Besides this main window, there were two smaller windows, one for questions, and one for chat (these were not visible to the F2F students). I recorded the entire two-hour lecture, broken into two parts, that was then posted online for students who couldn’t watch live, as well as for those who may want to refer to it again later. The students who attended the webinar version were from both sections of the course (I did a quick poll before class started). There were three main reasons why I wanted to try this. I have been thinking about trying this hybrid approach for a while, but the current impetus was that I have a guest speaker coming to class next week. After I invited him, I realized that I couldn’t ask him to do what I have been doing up until now, namely recording a separate podcast version for my online students and then teaching the lecture to my F2F section. I wanted to have a way to capture him speaking in class in one shot. Second, I have been a little uneasy about the fact that my online students were not benefiting from the spontaneous questions, discussions, demos, and announcements that would come up in class, and I wanted to capture that. Third, my in-class attendance has dropped off dramatically in the past couple of lectures (I’m guessing this is due to the F2F students having access to the online lecture podcasts) and I wanted to have another way for them to participate if they can’t (or won’t) attend in person. Aside from the usual software (PowerPoint, using presenter view; ArcGIS; Chrome browser) I used Adobe Connect for the webinar. I have used this for about two years for holding online office hours, so I was quite comfortable with setting it up. I presented using my own laptop (Dell Latitude E6520) and used my own newly-purchased wireless lavalier microphone. After consulting with my amazingly helpful colleagues through the U of T Educational Technology Interest Group, as well as a professional sound engineer (a friend of a friend), I decided to go with the Sennheiser ew100 G3 system. It worked very well, although the sound today was a bit muddy. I think this is mainly a matter of my learning the correct settings, especially mic sensitivity. I can also increase the sound quality settings in Adobe Connect next time, which takes a bit more bandwidth, but may be worth trying. I used my iPad (3rd generation) with the Adobe Connect app so I could see how the webinar looked from the students’ perspective, and it was easier for me to check for online questions without having to keep switching windows on my laptop. I didn’t go so far as to monitor the audio this way, but will do so next time (at least to check the quality). Really well! I had about 15 students watching online, and they were able to ask questions and use the chat window to talk with each other (this was minimal and not distracting). I got some very positive feedback and will definitely be doing this again. I’m really pleased that my online students now have the option of participating in a live lecture. I am considering teaching an online GIS course this fall. The course proposal is currently winding its way through various approval processes and so, in the meantime, I am devising a work plan for preparing the course. I’m really excited at the prospect of teaching online, and I’m optimistic that this teaching mode can offer real advantages for learning over face-to-face, at least for some students (I have proposed to teach the same course in both traditional and online modes, so students will have their choice). As I begin to plan what needs to be accomplished over the next few months in order to prepare my online course, I have realized that it is a daunting task. There are three main areas I need to work on, each with its own set of required concepts and skills: content, pedagogy, and technology. Yes, anyone teaching virtually anything these days has to work on those, but here I am going to address how they specifically relate to teaching GIS online. I have written before about curriculum design, textbooks, training vs. education, and working through an inventory of topics using tools such as the Geospatial Technology Competency Model and the UCGIS GIS&T Body of Knowledge. I will only add here that teaching in a discipline that is so technology-dependent is both a blessing and a curse: rapid changes to the field keep things relevant and exciting but, because the software and methods change so often, a significant amount of an instructor’s time has to be spent trying to stay current, both for their own professional development and for the sake of their courses and students. Don’t get me wrong – I’m not complaining, and it’s something that anyone teaching in this area must do, regardless of whether it’s online or in person or a hybrid of both. It keeps things fresh and interesting for both me and my students, but it does require a substantial amount of time. Beyond the GIS-oriented pedagogical considerations mentioned above, there are others specific to teaching online. I have just finished reading e-Learning and the Science of Instruction by Clark and Mayer (3rd ed., 2011) and it has been extremely helpful. Their book is based on years of empirical evidence gathered from their own work (Mayer has been especially prolific and influential) and others about how people learn (or don’t) with multimedia. First, I was relieved to see that I have actually been using some of their recommended methods for years, which I have found through other readings (e.g., Nancy Duarte’s slide:ology) or just from experience and instinct. However, there is much more I can adopt as well. A detailed discussion is beyond the scope of this discussion, but I think anyone considering online teaching should familiarize themselves with the basic principles of Mayer’s cognitive theory of multimedia learning (e.g., Mayer 2005; Clark and Mayer 2011) and other studies of teaching online in general (e.g., Balram and Dragic 2008; Nazari and Webber 2008; Ary and Brune 2011). Other pedagogical concepts to explore are problem-based learning (e.g., Drennon 2005; Pawson et al. 2006) and blended/hybrid learning (e.g., Olapiriyakul and Scher 2006; Detwiler 2008) and the increasing popularity of the flipped classroom. It’s certainly an exciting time for the development of technology-supported learning in its various forms. I look forward to launching my online course, and to exploring the potential of integrating technology and pedagogy in all of my courses, whether they are face to face, blended, or completely online. I am fortunate that my university has a Centre for Teaching Support and Innovation (CTSI) that, as the name implies, is a great resource for professional development and teaching support. I think all universities that are expanding their online and blended teaching have to recognize the necessary level of investment in time, energy, and resources in order to make the most of these new approaches. Even with great resources such as the CTSI, it seems as though faculty are often still left to their own devices to learn about and, hopefully, master the skills, methods, and concepts of effectively teaching with technology. This jack-of-all-trades approach is fun for me, but many faculty do not share my love of technology. Georgina and Olson (2008) list a number of impediments to the integration of technology and pedagogy, as well as some great recommendations, such as providing release time for instructors to acquire training, arranging technology mentors, and supplemental pay increases for faculty who are most involved in teaching with technology (I like the sound of that!). Universities need to develop and maintain a team of experts in graphic art, 3D modeling, animation, video production, web design, presentation skills, and instructional design to work with faculty to develop rich content for delivery in class and online. A Hollywood director is not expected to create a finished movie, complete with soundtrack, special effects, lighting, cinematography, etc., all by themselves. Likewise, instructors should not be expected to produce high quality, digital learning content and use effective new technology-oriented teaching methods all by themselves. I’m looking forward to teaching online, and will no doubt be writing more on the subject in the future! Ary, Eddie J, and Christopher W Brune. 2011. “A Comparison of Student Learning Outcomes in Traditional and Online Personal Finance Courses.” Journal of Online Learning and Teaching 7 (4): 465-474. Balram, Shivanand, and Suzana Dragic. 2008. “Collaborative spaces for GIS-based multimedia cartography in blended environments.” Computers & Education 50: 371-385. doi:10.1016/j.compedu.2006.07.004. Detwiler, James E. 2008. “Comparing Student Performance in Online and Blended Sections of a GIS Programming Class.” Transactions in GIS 12 (1) (February): 131-144. Drennon, Christine. 2005. “Teaching Geographic Information Systems in a Problem-Based Learning Environment.” Journal of Geography in Higher Education 29 (3) (November 1): 385-402. Georgina, D, and M Olson. 2008. “Integration of technology in higher education: A review of faculty self-perceptions.” The Internet and Higher Education 11 (1): 1-8. Mayer, Richard E., ed. 2005. The Cambridge Handbook of Multimedia Learning (Cambridge Handbooks in Psychology). Cambridge: Cambridge University Press. Nazari, Maryam, and Sheila Webber. 2008. Conceptions of geospatial information in online distance learning GIS programs. In IADIS International Conference e-Learning 2008, ed. Miguel Baptista Nunes and Maggie McPherson, 6:161-168. Amsterdam, The Nethelands. Pawson, Eric, Eric Fournier, Martin Haigh, Osvaldo Muniz, Julie Trafford, and Susan Vajoczki. 2006. “Problem-based Learning in Geography: Towards a Critical Assessment of its Purposes, Benefits and Risks.” Journal of Geography in Higher Education 30 (1) (March 1): 103-116. I recently had the good fortune to attend a GeoDesign workshop presented by Bill Miller, who is the Director of GeoDesign Services at Esri, and one of the people credited with coining the term. It was a fascinating morning, and it was a reflection of how important this topic is becoming that Alex Miller, president of ESRI Canada (and no relation to Bill), attended. I had been hearing more and more about GeoDesign, but only had a vague notion of what it was, and wondered if it was just the latest buzzword. 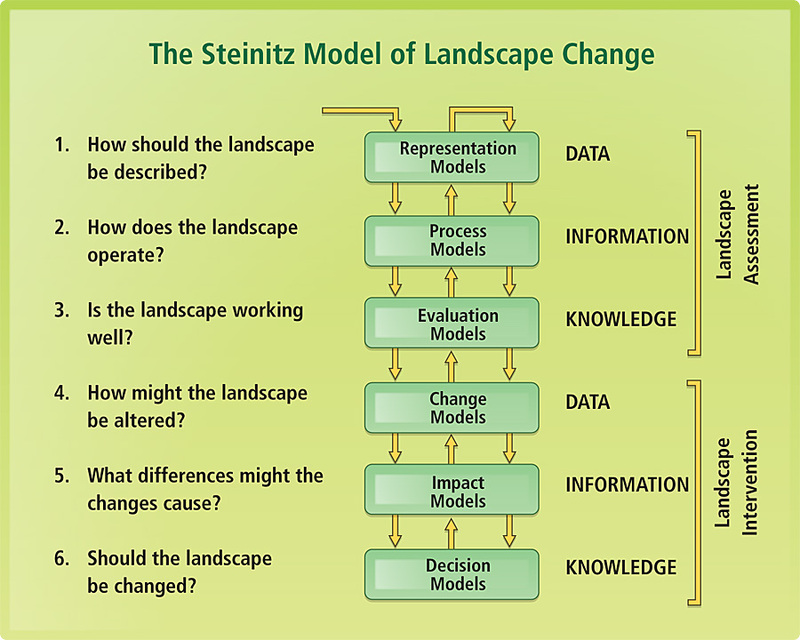 While it may be true that it is relatively new and trendy, as I listened to Bill’s presentation the concept just “clicked” for me, especially when he put it in the context of Carl Steinitz’s GeoDesign framework (previously called the model of landscape change). I instantly saw the value of using this as a framework for teaching problem solving to my GIS students. After the workshop, I realized that there has been an explosion of activity related to GeoDesign, which made me feel a bit late to the party. If you’re like me, a great place to start is the GeoDesign Summit website, which has a number of recorded presentations from the conferences. As I watched them, I was struck by the sheer number of examples of GeoDesign given by the speakers. I think there are several reasons for this: the definition of GeoDesign is still evolving, and it is easier to define it by example; these examples provide dramatic proof of the relevance and power of GeoDesign and each presenter wants to make that clear; most speakers tend to talk about what they know, and so approach the topic from their own area of expertise and how they are using GeoDesign; and, by providing so many examples, each participant is hoping that others will see overlaps with their own discipline, which will then promote cross-fertilization of ideas. It is fascinating to watch as all of these big thinkers hash out ideas. Another great resource is the comprehensive GeoDesign Bibliography created and maintained by Matt Artz. From what I have seen and read so far, I have found some useful nuggets. Tom Fisher, Dean of the College of Design at the University of Minnesota, said that “Geography looks at the way the world is and the way the world was. Design looks at what could be” (The What and Why of GeoDesign). I think GeoDesign is still many things to many people, but I’m struck by the number of definitions and explanations of GeoDesign that mention the words “integrate” and “collaborate”. This seems to get at the heart of it, as exemplified by Kimon Onuma’s presentation Getting Real with GeoDesign and BIM and the concept of “BIM Storms” where a group of people collaborate in real time to design one or more buildings in a short period of time through the integration of a number of tools, including GIS. The appeal of GeoDesign as a teaching concept stems from its grounding in high-level, conceptual thinking. When teaching GIS/GIScience, it is easy for students to lose sight of the forest for the trees; we spend a lot of time discussing specific tools and how they are used to solve small, specific problems (“How far away is it? How many are found in this area?”). GeoDesign provides an opportunity to show students how to approach a problem at a conceptual level, how to evaluate the process, how to include different types of reasoning (e.g., inductive, deductive, abductive), while also providing opportunities to drill down at each stage of the process to examine what tools should be used, how, and why. One of the best quotes I’ve seen about GeoDesign was from James Fee, who contends, “I think we’ve all been doing GeoDesign…for years, even decades, but not as a whole concept to implementation practice” (ESRI, 2010). I find it interesting that, what is now referred to by Bill Miller as Carl Steinitz’s “GeoDesign Framework”, was originally created as a framework of theory for education (specifically for landscape architects) (Steinitz, 1990). Bill Miller mentioned during his talk that students need to learn methods for problem-solving, and that the GeoDesign framework is one such method. I agree, and I’m sure that many instructors, such as those at Northern Arizona University who have recently started a blog GeoDesign in the Curriculum, are contemplating how they might incorporate GeoDesign into their curricula. Many students will be excited by the possibilities of GeoDesign and its potential for integrating, collaborating, and connecting the past, present, and future. Steinitz, Carl, Peter Rogers, Garrett Eckbo, Anne Spirn, and Angus Hills. 1990. A Framework for Theory Applicable to the Education of Landscape Architects ( and Other Environmental Design Professionals ), Landscape Journal 9 (2): 136-143. I was skimming through my Twitter stream this morning and came across a tweet from the intrepid Michael Gould (@michael_d_gould) mentioning David J. Unwin’s digital workbook “Numbers aren’t nasty: a workbook of spatial concepts“. I’m a big fan of David Unwin’s Geographic Information Analysis (co-authored with David O’Sullivan), so I downloaded the workbook (it’s free) and the accompanying data sets. I was intrigued to see that this included coordinate data for John Snow‘s map of cholera deaths. Virtually every GIS student learns about the pioneering epidemiological work John Snow did using spatial analysis of cholera deaths, tracing them to the infamous Broad Street pump. I thought I would be clever and quickly map them using Google Fusion Tables. What I soon realized was that the coordinates were created using an arbitrary system that placed them somewhere in Africa and, as is often the case, realized that I needed to slow down, take a closer look at the data and what I was doing, and see what was going on. As this is based on a sketch map scanned from a book, all locations should be treated as approximate. I hadn’t used ArcGIS Explorer much, and intend to incorporate it into my courses, so this was a good excuse to try it out. Once I got it on the web, I did another search and found that someone else had already put a similar version online – oh well! At least I learned a lot by going through this exercise, and what else was I going to do on a Friday afternoon? I will be the first to say I made this as a quick example, and would not put too much faith in it. However, I may spend more time on this later, as it might be a good data set for illustrating density analysis. So, there you have it. Out of one tweet I read this morning came an entire day’s activity and some data and figures I can use in one of my GIS courses. Twitter can eat up a lot of time, but sometimes I come across little gems that can be really interesting and useful. Update: I have created a map data layer package of the pump and death locations that can be downloaded from ArcGIS.com. Update: I have created zipped shapefile and KML versions of the files as well, both in GCS (WGS84). In both versions, there are three files: one file contains one point location of the Broad Street Pump, one files includes all of the pumps in the original map (including the Broad Street pump) and one file contains the cholera deaths recorded on the map.